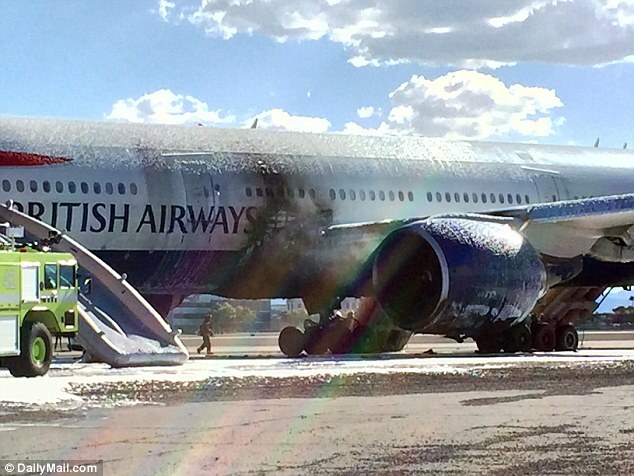 A passenger on the British Airways flight which caught fire on a runway in Las Vegas has described the horrifying moment he looked out of the window to see the ground beneath the plane was a burning 'pool of gasoline'. The man, who managed to take one picture before running for his life, has revealed his terror as he realised the danger he and 156 other passengers were in after the left engine exploded as the plane accelerated on Tuesday. 'If it happened 30 seconds later I do not see how we could have survived,' the passenger told MailOnline. The man, who asked not be named, revealed how everything had been normal as they prepared to take off from McCarran International Airport on Tuesday afternoon. But then, about a third of the way along the runway, something strange happened. 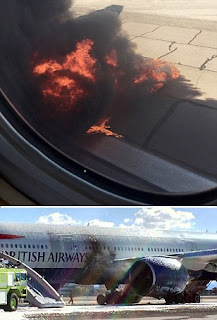 'We heard a pop,' said the man, who was sitting by the window in business class. 'It was like when you are driving and get a puncture. 'But there was a woman sitting next to me, and as soon as that happened, she dropped the divider [between the seats]. At the controls, pilot Chris Henkey - just days away from retirement - had slammed the breaks on, stopping the plane which had been travelling at 90mph in just nine seconds.